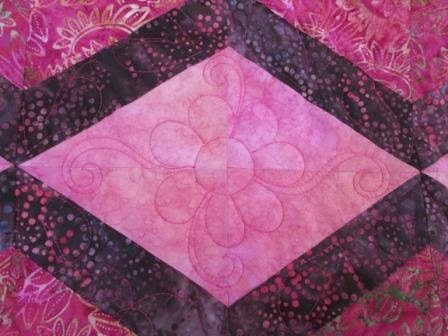 I have taken some photos of my customers quilt again. I forget sometimes. This quilt was made by Sandra. 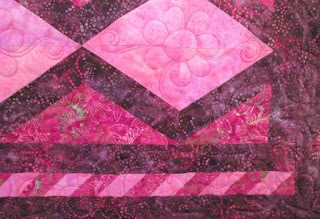 She wanted some kind of special little quilting on the pink diamond and wanted a thread that would show up. I drew out a flower and spirals and she liked that. I thought it turned out great, and best of all she loved it. I did leaves and loops over the rest of the quilt. Sandra called this quilt Sleeping Beauty. Here is a larger photo of it hanging on the rails of the machine. Two of the sides have this cute boarder. I just love it. It is made up of half square triangles. I took the photo so I can use this idea on one of my quilts someday. 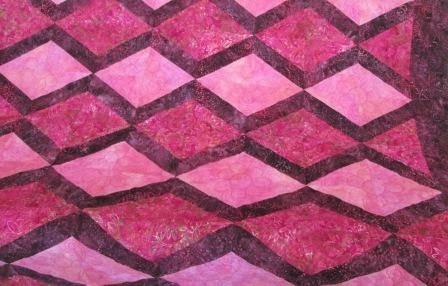 I have been very busy machine quilting as the Christmas rush is on (and a few for Weddings).